The Minister of Youths and Sports, Solomon Dalung, is to hold an emergency meeting with the Technical Committee of the Nigeria Football Federation (NFF) on Tuesday, an official has said. Nneka Ikem-Anibeze, the minister’s Special Assistant (Media), said in a statement in Abuja on Sunday that the meeting would hold in the Minister’s conference room at the Federal Secretariat in Abuja. 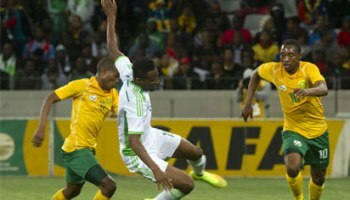 The meeting is coming on the heels of the Super Eagles’ 0-2 loss to visiting Bafana Bafana at Uyo on Saturday. The loss has thus placed Nigeria third on the Group E table behind South Africa and Libya in the 2019 Africa Cup of Nations (AFCON) Qualifiers. Ikem-Anibeze said further that Dalung has meanwhile urged football lovers and other Nigerians to collectively support the Super Eagles in their quest for 2019 AFCON and 2018 World Cup tickets. “This is a temporary setback which is surmountable. We need to sit with the Technical Committee and the team’s technical crew to find out the immediate and remote causes of this setback. “We have very young talented players in the Super Eagles and we trust that with more hard work and determination, this result can be reversed when we go to South Africa,’’ Dalung was quoted as saying. He said further that Saturday’s match was just the beginning of a long journey. “The Super Eagles will definitely be in Cameroon because we can’t afford to be absent at the AFCON for a third consecutive time.